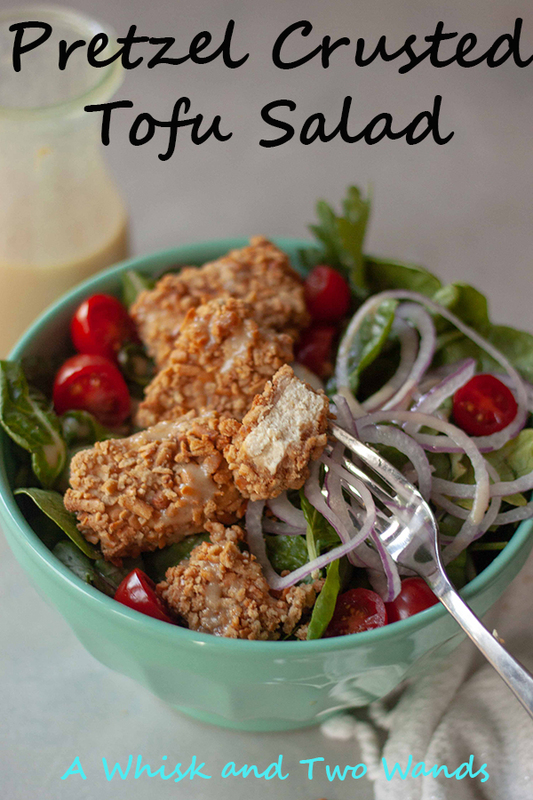 Sometimes you just crave a good salad to start the week and this Pretzel Crusted Tofu Salad with Honey Mustard Vinaigrette is a perfect choice for Meatless Monday! 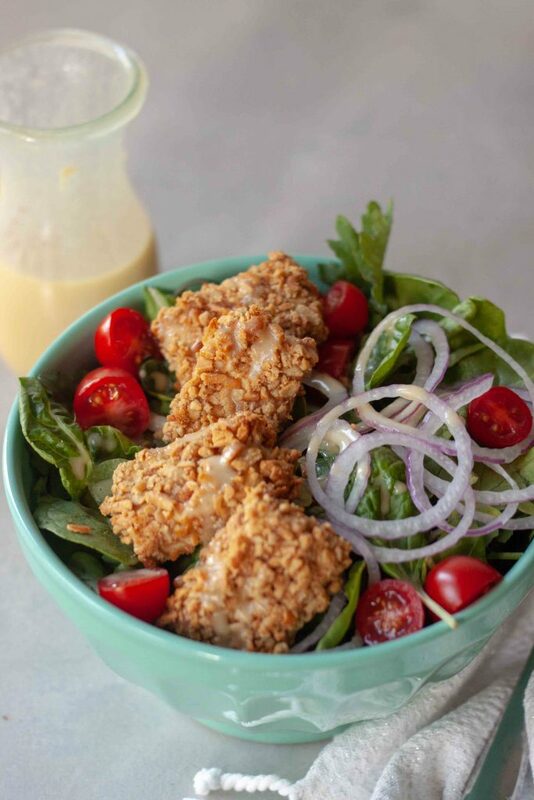 A delicious meatless twist on a classic honey mustard chicken salad, basic but far from boring. I wanted to first let you know that things are a little crazy, more to come on that in the future and while I’m going to try to keep up with 2 posts a week it might be only 1 some for awhile. 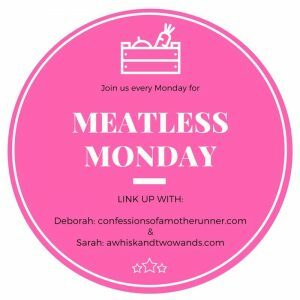 With that said I want to continue to give you quality content and I will for sure be posting on Monday for Meatless Monday. I haven’t been posting on Instagram daily in the last week but plan to pick that up and share more there, or have S help out with that for the next month and a half. The other thing I’ve thought about is re-sharing some of our old favorites that you may have missed. Either way I hope to be back regular posting in September. Now again where are these people that say salads are boring? I hear this all the time and it always confuses me and has me wondering are they eating just plain lettuce? Or maybe lettuce and heavy dressing you only taste the dressing and it has no texture? 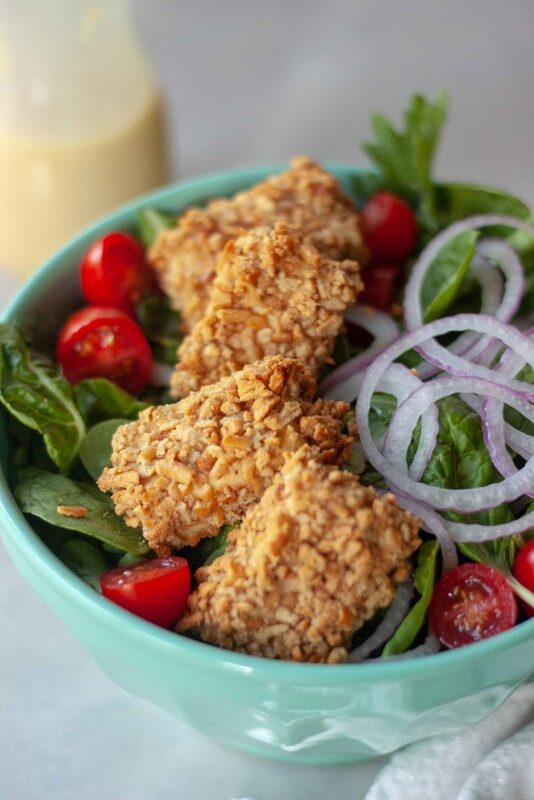 While this is a salad recipe the real star of the show is the Pretzel Crusted Tofu! You don’t have to have it on a salad but it makes for one crunchy and exciting one even though it may be considered simple and basic. If you do make just the Pretzel Crusted Tofu it’s really good dipped in honey mustard and it’s easy to make your own just adding a little honey to taste to Dejon mustard (Sir Kensington’s is my favorite). It’s far from soggy flavorless tofu so if that’s how you last had it and haven’t had it since give it another try this way! I use my favorite pretzels, Quinn Pretzels, which just happen to be gluten free, and I’m so happy are finally in Whole Foods where we live. You can use any pretzels you like or have on hand. I actually decided to make this salad one day while snacking on pretzels and dipped in mustard. The salad is very versatile and you can pretty much use any green, although I like spinach or a blend like I used here of baby spinach, chard, and baby kale. If I have carrots or other veggies I may add them as well. A great way to use leftover veggies. 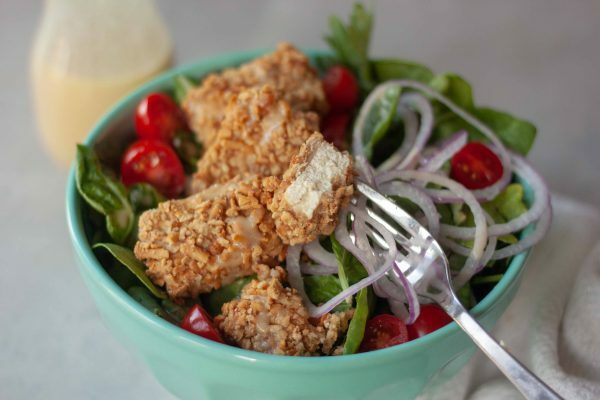 Buying pressed extra firm tofu or pressing it ahead of time in the refrigerator you can pull this salad, with the Crunchy Pretzel Tofu, together in less than 30 minutes. If you need to press the tofu than it will be closer to an hour as you have to press it for 30 minutes but can be done while you are getting other things done. It’s all about quick and easy right now! I look forward to seeing what’s happening in your kitchen and hope you link up with me and my co-host Deborah and share! I also hope you check out and are inspired by the recipes linked up below. 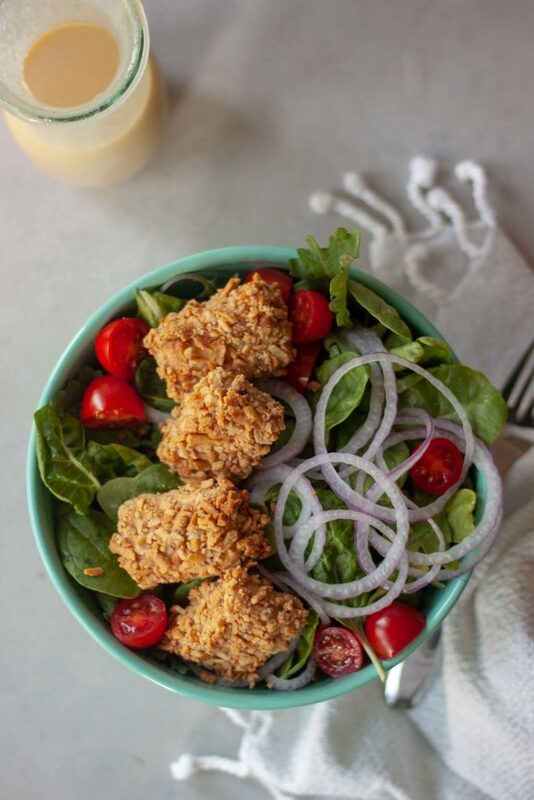 Pretzel Crusted Tofu Salad is a bed of greens topped with tomatoes, onions, crunchy gluten-free pretzel crusted tofu nuggets, and drizzled with homemade honey mustard dressing! Quick and easy it makes a great weeknight dinner. Shake blend or stir ingredients together until smooth, add the extra sweetener or salt and pepper to taste. Cut tofu blocks into thirds length-wise. Lay paper towels down on a plate or cutting board. Place tofu on the paper towels and put another layer of on top of the tofu. Put another plate or a cutting board on top of the paper towels and then weigh it down with heavy books, cans, or even a cast iron skillet. Let sit for at least 30 minutes or you can do this ahead and keep in the fridge longer. Pulse pretzel sticks in a food processor until course ground and no large pieces. Combine flour, salt, and pepper in a medium bowl. Whisk almond milk and mustard in another bowl. Place crushed pretzels in a 3rd bowl or plate. Cut each of the 6 tofu blocks into thirds. Dip each tofu slice with flour, shake, then dip in almond milk, and then coat with pretzel mixture, pressing gently so it sticks well to the tofu. Place tofu slices on the parchment paper lined baking sheet and bake for 15-18 minutes until golden brown. Put greens on plates or in bowls. Top with sliced tomatoes, onions, and Pretzel Crusted Tofu. Drizzle or serve with Honey Mustard Vinaigrette (shake vinaigrette first to reincorporate). You have to try it, I know you’ll love it! Focus on what’s important in your life! And eat lots of this awsome salad! Thank you Patrick. I want to do it all but right now my body just can’t keep up and it’s hard but exactly I have to focus on what’s important and adjust things a little to keep up with what I can. All about that flavor and texture combo! This crispy tofu looks amazing! I’ve got to try it. Thanks for hosting! I love this idea! 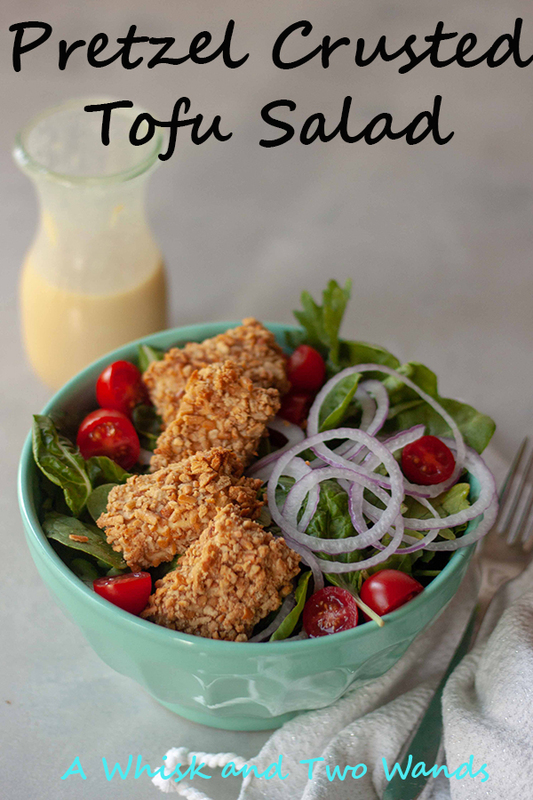 I’ve done pretzel-crusted chicken, but this looks great for a meatless meal since both my husband and I like tofu. This is great on chicken too, which I did for some of the family. It’s great to have options and switch things up.